Most of the time I receive simple questions in the emails about making simple circuits for example how to connect/wire LED's etc. So I decided to answer these questions in a brief way to guide beginner electronic students and those who are recently started in electronics world. Making LED projects provides a lot of fun and knowledge in the field of electronics, there are many types and colours of LEDs are available in the markets and their usage is growing day by day. Now a days almost every electronic device use LEDs. But if you want to use LEDs in any way it is better to connet or wire them in right way. You can not drive LEDs directly with the batteries, doing that will burn the LEDs instantly or shorten their life. So it is always good to use a current limiting resistor in the series with LEDs. Only you have to add some specs of your LED like supply voltage, drop voltage or forward voltage, current ratings and the number of LEDs and it will give you a resistor value to use with your LEDs. May be you are thinking from where you will get these values? it is not a problem, most LEDs specs contains these values and it is essential to use the exact values as shown in the LED specs. But if you dont have the specs than you can get these values with the help of the following guide. In the supply voltage field of the resistor calculator you have to write the voltage you want to use to run the LEDs for example 4, 5, 6, 9 or 12 etc. For forward voltage you have to take help with the LED colour. If your LED is blue or white then select 3.3 or 3.5 volts and if they are red, green and other select 2 volts. Most of the 3mm size LEDs use 20mA or 30mA current for full brightness. Use 30mA for white and blue and 20mA for red, green and other colour. For big LEDs you have to see their specs. In this field you have to write the number of LEDs you want to use. For connecting LEDs first of all it is require to know their connecting points or connection polarity clearly. 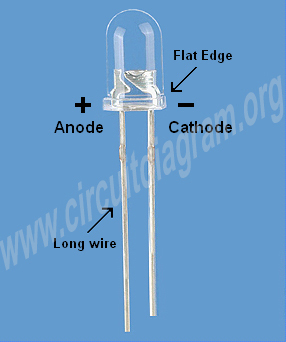 The picture shown below is describing the poliraty of a LED. You can easily understand the positive and negative points of any LED with the help of its long and short leads or the flat edge. 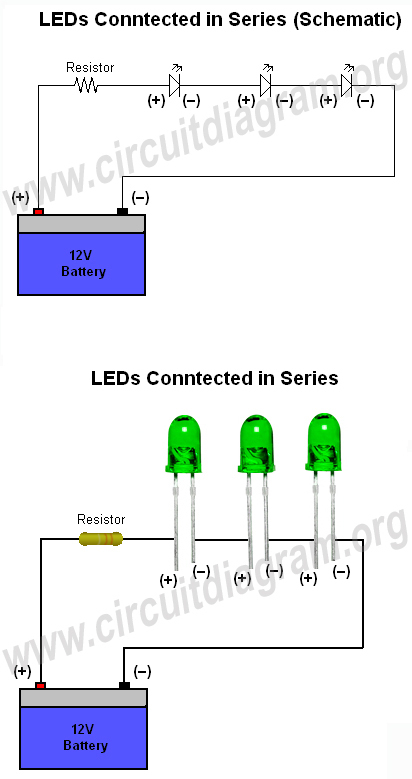 Connecting LEDs in series is a prefered method when operating with batteries it saves power because if you connect them in parallel then each of them requires a separate resistor and each resistor waste some amount of power so the fewer resistors the better. 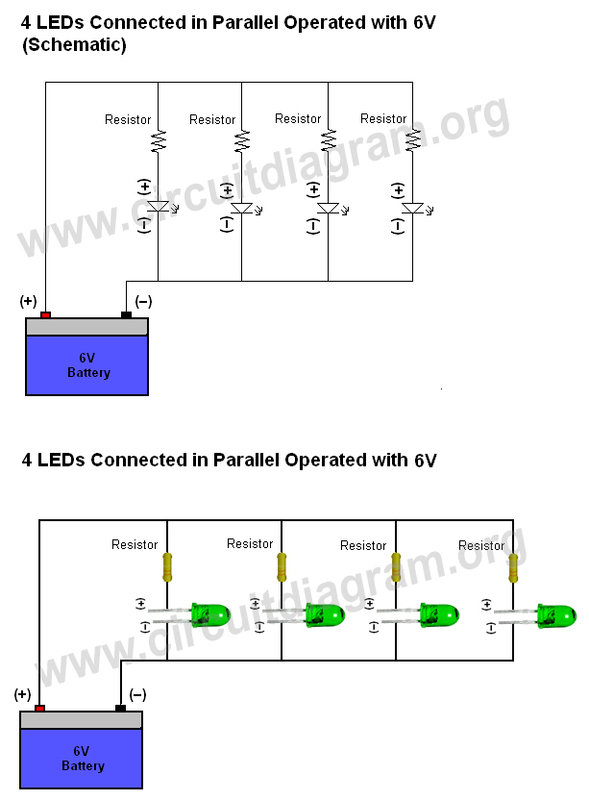 If your LEDs are wired in series then one resistor can work as a current limiter for many LEDs but there are some limits of connecting them in series for example you can not operate 4 LEDs of 3 volts with 6 volts supply in series because 4 LEDs of 3 volts are equal to 12 volts so they require 12 volt DC but in parallel you can do that by simply connecting each LED with a separate resistor.